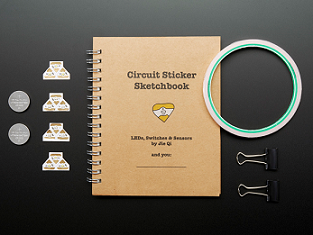 Chibitronics Starter Kit comes with the illustrated Circuit Sticker Sketchbook. The Sketchbook walks you though five circuit concepts including parallel circuits, switches and resistance-based sensors. Every activity comes with a circuit theory lesson, a template with drawing activity and then an open-ended activity for you to design and create your own circuits. Since the circuits are completed right on the pages of the book, you will have an interactive sketchbook of working circuits to refer to as you design your own projects. Best of all, you'll be able to learn new electronics concepts while also expressing yourself in whole new ways. Use these peel-and-stick circuits to add electronics to any sticker-friendly surface: paper, fabric, plastic, the sky's the limit! Circuit Stickers are an approachable way to learn and create electronics through craft, whether you're just starting out with circuits, lighting up your favorite art, craft or science project.